TSPSC Group 4 Results (Merit list) 2019 (Announced) | Selected Candidates List & Cutoff Marks @ tspsc.gov.in. TSPSC Group 4 Results Merit List 2018-19 Released |TS Group IV selection List, Cutoff marks @ tspsc.gov.in. TSPSC Secretary Vani Prasad released the merit list of Group-4 jobs in the state today. 2.72 lakh people in Group-4 Merit list Group-4 jobs in government departments, junior assistant in RTC, GHMC, Bill Collector and Beverages Corporation, among others, have been awarded the minimum qualification marks in the written examination. This list is listed on the Commission website. Candidates who attended are waiting for their exam results. candidates are requested to download the TSPSC group 4 Exam Results , merit list available in this page. 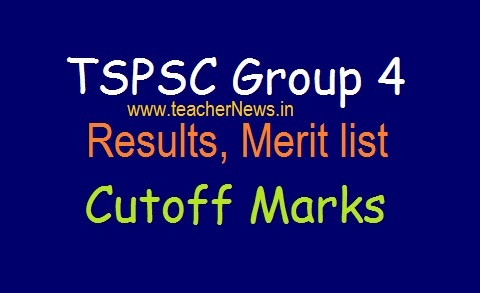 TSPSC Group 4 Results (Merit list) 2019 (Announced) | Selected Candidates List & Cutoff Marks @ tspsc.gov.in. Details of Telangana PSC Group 4 Exam results @ tspsc.gov.in. Telangana State Public Service Commission (TSPSC) annually announces various recruitment notifications for the state level Government jobs. This year the TSPSC has advertised 1521 Group 4 Posts in the state of Telangana. The vacancies advertised for various departments revenue department, panchayat raj department, commercial tax department, forest department, home department, and others. Candidates, who have applied for the above Notifications that downloaded their Hall Tickets from Commission’s Official Website www.tspsc.gov.in. And appeared the examination for Group 4 posts on Sunday i,e., October 7, 2018. The Paper-II exam held from 10:00 am to 12.30 pm while Paper-I exam conducted from 2.30 pm to 5.00 pm on Sunday. TSPSC Group 4 Results 2018-2019 Merit list released. Download TS Group 4 Cutoff Marks, Merit List selection List for Group IV, Jr Assts in RTC, Bill Collector in GHMC.